Did you have as much fun as we did with our last big giveaway, when we had a contest to give away a Dooney & Bourke Purse?! Well then, we’re in for a surprise for you — or maybe not, based on a poll we ran earlier in the month! 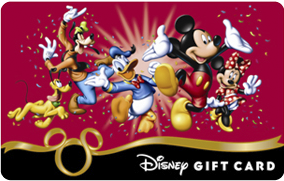 The readers have spoken with their mice, and starting on Sunday, April 1st, 2012 — and this is NO April Fools Joke — we will be giving away one $100 Disney Gift Card to a very lucky fan! The contest will run from Sunday, April 1st, 2012 starting at 12:01 AM until Monday, April 16th, 2012 at 12:01AM. Your authors debated running it until April 15th, 2012 — the traditional Tax Day in the United States — but decided to run it until April 16th so that you could have that mad rush of getting your entry in at the last minute on April 15th, just like many of us used to do when we mailed our tax returns to the IRS at the last possible moment! Look for the official kick-off post on Sunday, which will include a link to where you can enter the contest, and good luck everyone! The Next Disney Moms Giveaway Poll!